A fairly long time ago (2005), a game was released that I absolutely loved, that game being Backstage. Since Backstage was a survival-horror created using fairly cartoonish, 2D sprites, I thought that there wasn't a chance in hell that the game could scare me in a visual sense... and I was right. The graphics didn't really work and certainly didn't contribute to the amount of "horror" present in the game. 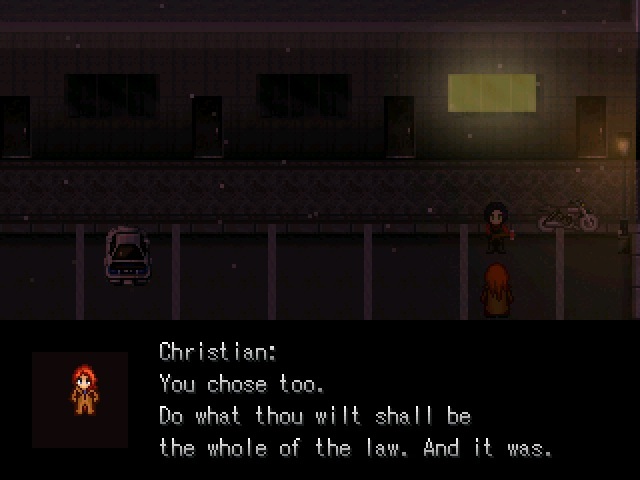 However, the game still managed to be creepy, all thanks to a well-written plot and a cast of incredibly weird characters. In fact, I'd go as far as saying that Backstage contains one of my favourite NPC characters of all time, one Detective Wilks... you'll just have to play the game to see why else I'll spoil it for you. Anyway, this is fairly irrelevant since Backstage has been out for a while now. What is relevant is that the developer, Max McGee (who currently has one of his games, Iron Gaia, featured at the moment) has re-started work on the sequel, Backstage II, after a long hiatus. I couldn't be more excited! Sporting a new menu-system coded by Archeia_Nessiah, a vastly improved battle-system compared to the original and a set of graphics and maps that actually look like they belong in a survival-horror game, all Backstage II really needs to do to ensure its success is to replicate the terrific storyline that the first game featured. Here's hoping I'm not dissapointed if (when?) this game is finally released! Better lighting effects and maps should make Backstage II a better horror game, at least in the graphics department. You can check out the RPGMaker.net homepage for Backstage II here. Or you can visit the developer's site, Ghostlight Games, here. I remember Backstage! Had no idea there was a Backstage II. Looks a bit creepy and a lot of fun! really creative and interesting stuff you have in here! i'll be following you! Normal that I didn't heard nothing if it's made with rpg maker lol, but not commercial doesn't mean no good, normally is totally au contraire. Sure, lighting in that screenshot could be improved, but I guess that would be very hard with low graphics? Backstage looks like a very promising game regardless, I'll check it out. Btw, maybe having it darker farther away from you, like in Amnesia, the game would be so scary no one would ever play! Interesting, I'll have to check this out later! Bookmarked it, and following your blog also.